Structural waterproofing is vitally important in the modern environment as property owners choose to extend buildings below ground, either by constructing basements or converting existing cellars or vaults into habitable spaces. 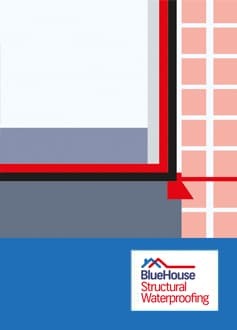 Blue House are able to design and install a wide range of waterproofing solutions from barrier systems, technically described as Type A, to water management systems, known as Type C. Whether it be Type A or Type C waterproofing systems we use the latest technology to ensure your property remains damp free. All of our surveyors have been Certified in Structural Waterproofing by the Property Care Association, so as well as specifying waterproofing systems for new build and refurbishment projects they are qualified to diagnose existing building defects giving rise to water ingress and recommend and specify the most appropriate remedial work. For your peace of mind we are able to offer a 10 year insurance backed guarantee.